We did it! We managed to get all four of us there and back again with all limbs and belongings intact! Babies behaved, extended family were reacquainted, and experiences abounded. In typical Guzek style, the trip got off to a rocky start. A mere 10 minute delay in leaving the house as scheduled resulted in missing the bus to the airport, which Maxon was super excited about. That meant we had to hightail it to the airport and managed to unload all the baggage, park the car, and get everything checked in within a couple minutes of the baggage cut-off. We also could not get our seats together on either of our legs to Florida but luckily the kids were pretty cooperative and the drama ended there. 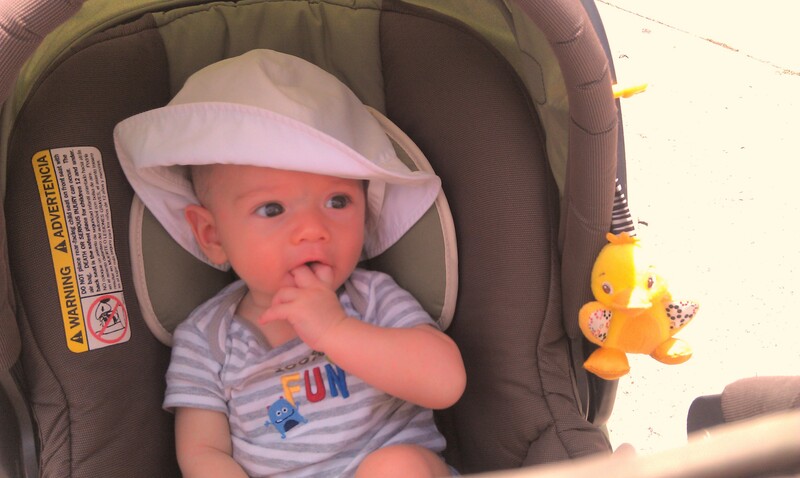 The beach wasn’t a huge hit with Maxon but we’ll give him credit for giving it a try. He was even willing to go shirtless AND shoeless! The kiddie pool was just all right but did he ever love the pool at the house. He played in there for hours! We may have just evened out his farmer’s tan to boot. We also ventured outside of the beach and the pool. We did a day trip to St. Augustine, the oldest city in the US, and explored the Castillo de San Marcos and walked around the downtown in the search for some lunch. We also caught the ferry to nearby Fort Matanzas, which seemed so insignificant in comparison to the Castillo but you can’t turn down a free boat ride when you’re vacationing with a toddler. Eating alligator tail. This is proof that if meat is breaded, fried, and in nugget form, a toddler is willing to eat it. Cooper decided to mark his fourth month on this earth with rolling over from his back to his belly! He has been working hard on his leg kicks and rolling from side to side lately so it was just a matter of time before momentum took over. After completing the entire motion, he celebrated his milestone by putting on his frowny face and bursting into tears. Way to go, big fella. And for your next trick… waking up less than 3 times a night? Maybe? Yes? Mommy is counting on you! Cooper likes to keep me guessing. After a couple of weeks with 4-5 hour stretches of peaceful sleep, waking one or two times a night, and going back to sleep quickly, I have been getting newborn flashbacks this week of waking every 1-2 hours and taking forever going back to sleep and then refusing to stay asleep once laid back down in his crib. Maybe he hates the swaddle, although once his arms are free they go directly to attacking his head with his sharp fingernails. Maybe it’s the “4-month sleep regression” I’ve read about, although he is technically only 3.5 months. Maybe it’s teething. Or maybe it’s just a phase. Or, as I often think in the middle of the night as I endlessly rock in the glider, maybe this is forever. Even daytime naps are askew, going from a predictable 45-minute nap to maybe only 15-20 minutes. The only exception is if I am somehow touching him. His best and longest naps are always when I have him in the wrap. And when I have declared defeat in the middle of the night and I lay him down in our bed beside me, he doesn’t move a muscle. Any restlessness can be stilled by placing a hand on his arm or tummy. I can’t tell if that means he just needs even MORE mommy time or if he is just messing with me! He also hasn’t ever really totally embraced the pacifier. He will accept it during a fussy moment but usually it serves as a distraction, with an expression on his face that shows that he thinks it’s pretty cute you offered it. He will just play with it a bit and then spit it out. This week I’ve offered it when I’m trying to calm him down for a nap and he’ll take it and then pass out within a minute, and then lets go of it. I wouldn’t mind if he associates the pacifier as a request from Mommy to fall asleep. Of course, see above paragraph about *staying* asleep. We also tried offering a bottle last week for the first time. He didn’t hate it but he didn’t seem to get what all the fuss was about. Again, cute that there was milk in the bottle but he’ll wait for the real thing, thank you very much. We will save that battle (bottle?) for later. Then there is this whole business of rolling over. He rolled over all day long this one day two weeks ago and has not been remotely interested in doing it again since then. 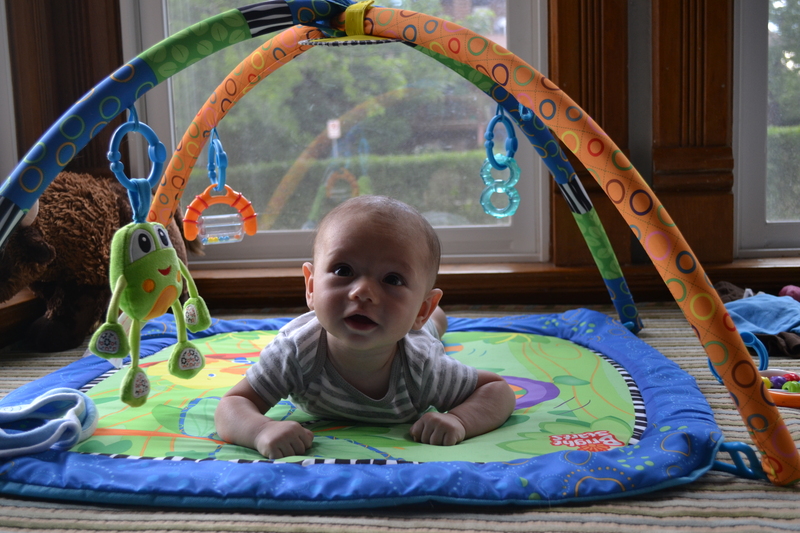 Instead will stay on his tummy, high up on his elbows just checking things out. I guess we have to work on one superpower at a time. Even these pictures, taken seconds apart, seem to be of different kids. They’re both pretty cute so I guess we’ll keep ’em! 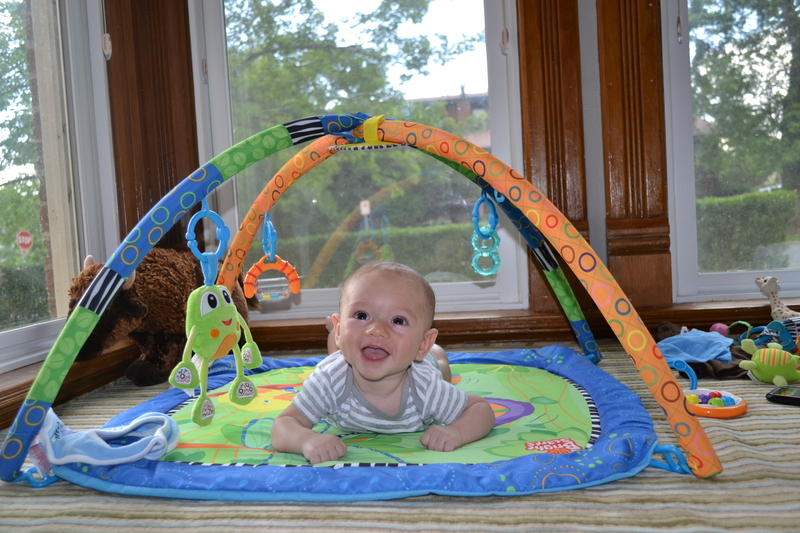 We are 2 for 2 in loving the crib mobile. Cooper took a little longer to come around and his attention span is not quite as long but it looks like the lion has another devoted fan.